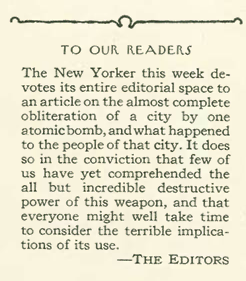 The editorial that accompanied John Hersey’s “Hiroshima” when it appeared in a 1946 issue of The New Yorker. This coming August will mark the seventieth anniversary of the atomic bombings of Hiroshima and Nagasaki. The way we choose to memorialize particular historical events is of course a fraught and complex process (case in point: the recent debates over the meaning and message of the World Trade Center Memorial). Come August, I’m certain there will be a profusion of thoughtful commemorative events both both in the US and abroad, but I’d like to propose a more humble way to memorialize the bombings: read (or re-read, as the case may be) John Hersey’s Hiroshima. Hiroshima first appeared as an article in the August 31, 1946 issue of the New Yorker. At the time, the editors felt so strongly about the story’s narrative power and political import that they devoted the entire issue to it.Later that year Knopf published it as a book. Hiroshima follows six survivors from the moments immediately preceding the bomb’s detonation to one year after. We meet Toshiko Sasaki, a local factory worker, Kiyoshi Tanimoto, a pastor at the Hiroshima Methodist Church, Willhelm Kleinsorge, a German Jesuit priest, Masakazu Fujii, a family doctor, Hatsuyo Nakamura, a widower seamstress, and Terufumi Sasaki, a hospital physician, as they navigate the confusion wrought by a city that had been suddenly obliterated in a matter of seconds. Most immediately striking about Hiroshima is its level of detail. Hersey’s interlocutors recall scenes of human carnage and horror with remarkable clarity. Hersey’s lucid prose style amplifies the immediacy of the narrative; it is as though the survivors are recounting their stories directly to us, with Hersey merely acting as the medium of transmission. The book was an immediate bestseller, and its publication is often pointed to as an event that forced Americans to come to terms with the morality and meaning of atomic bombs. And indeed, Hiroshima did indeed do the important work of giving a human face to the realities of nuclear war. Thinking about the book in the context of broader contemporaneous culture, however, I wonder if we haven’t overstated the book’s impact. In fact, by continuing to follow the life of one of Hersey’s informants into the years after the book’s publication, we can see just how ambivalent Americans remained about their complicity in the bomb. Ten years after Hiroshima’s publication, Kiyoshi Tanimoto, the Methodist pastor whose story Hersey told, was featured as the subject of an episode of “This is Your Life,” a television show that surprised guests with figures from their past who had in some way influenced the way their lives had turned out. In Tanimoto’s episode (which can be viewed here), we meet his former classmates from theology school, his wife, and a mentor from his youth, but the climax is his introduction to Captain Robert Lewis. Lewis was one of the co-pilots of Enola Gay, the plane that dropped the bomb on Hiroshima. In this moment, Tanimoto is stone-faced and visibly uncomfortable, saying only a few words to Lewis. Lewis nervously describes the experience of receiving the order and dropping the bomb on Hiroshima, explaining that after the mission was complete, he wrote in his log book: “My God, what have we done?” Lewis’ appearance is the only point in the show where we see an expression of remorse. Otherwise, the bombing is described almost as if it had been a natural disaster: something that had caused death and destruction on an unfathomable scale, but that no one could have prevented. In its sentimentalizing of Tanimoto’s life experiences and the reduction of blame to a single pilot, this “This is Your Life” episode, in my mind, is more emblematic of the state of American thought on the bomb than Hiroshima. Taken together, Hiroshima and “This is Your Life” represent the conflict Americans faced in grappling with the bomb: a recognition that what had happened had caused profound death and destruction, but an inability to accept that their citizenship made them in some way personally complicit in the act. For those readers looking for a more explicitly history of science-related book, Susan Lindee’s Suffering Made Real is a good place to start. This entry was posted in Uncategorized on September 23, 2014 by Leah Aronowsky. i'm a graduate student in history of science.